Rocky is a 2-year old Jardine’s parrot who presented to our clinic’s emergency service because of lethargy and anorexia of 4-days duration. On initial examination Rocky was found to be in serious condition. He was thin, extremely weak, had pale mucous membranes and had an inflamed tongue with multiple pustules. Rocky was the only pet in the house and lived in a bird safe cage with safe toys, and was only out of his cage under supervision. The owners were not aware of any trauma or other conditions that might have explained Rocky’s lack of appetite. They did however report that Rocky’s tongue had been bothering him for several days. At this time it was believed that the most likely cause of Rocky’s anorexia and secondary lethargy was his tongue. When we questioned the owners about Rocky’s diet they reported that he only ate sunflower seeds because that’s all he liked. This immediately aroused suspicion that Rocky’s condition might be due to a severe dietary deficiency of essential vitamins and minerals. Seeds are deficient in many vitamins, minerals and amino acids- particularly vitamins A, D, E and K. They are also high in fat and cholesterol, and low in calcium. Of particular importance to Rocky’s case are the low levels of vitamins A in sunflower seeds. Vitamin A is extremely important for the overall health and well being of all animals. It is particularly important in areas of the body where cells are frequently regenerated -such as the skin and mucous membranes of the mouth, intestines, airways, and urogenital system. Vitamin A deficiency can lead to a weakening in these areas of the body and allow bacteria to invade the tissue causing inflammation and infection. These types of infections can be made worse and easily spread in the vitamin deficient A patient because this vitamin also plays a key role in immune system health. Finally, certain fruit and vegetable sources of vitamin A may also play a role as antioxidants. Antioxidants function to reduce the inflammatory effects of oxygen free radicals which are produced during normal metabolism and may contribute to certain chronic diseases. As previously mentioned seeds, particularly sunflower seeds, are a poor source of vitamin A. On average sunflower seeds contain one-tenth of the required amount of vitamin A for parrots. Therefore a bird eating predominantly sunflower seeds, like Rocky, may sooner or later succumb to a one or more serious side-effects of this deficiency. To prevent this problem it is important to offer your parrot a diet rich in vitamin A. Good sources of vitamin A include: dark leafy greens such as kale and spinach, carrots, apricots, cantaloupe, mango, papaya, peaches and peppers. It is important to offer a variety of these and other fruits and vegetables to your parrot daily or at least a few times a week. Additionally, we strongly recommend that at least 70% of your parrot’s diet be comprised of commercial bird pellets. These foods are formulated to provide adequate levels of vitamin A, in addition to all major vitamins and minerals. Given Rocky’s serious condition, and our suspicions as to the possible cause of his illness we admitted him to the hospital for additional tests, treatment and supportive care. We performed a complete blood count and chemistry panel on Rocky to allow us to better evaluate his general health and organ function. The main finding was an elevated white blood cell function, indicative of a moderate to severe infection. Rocky also had a serious anemia, likely explaining his pale color and weakness. 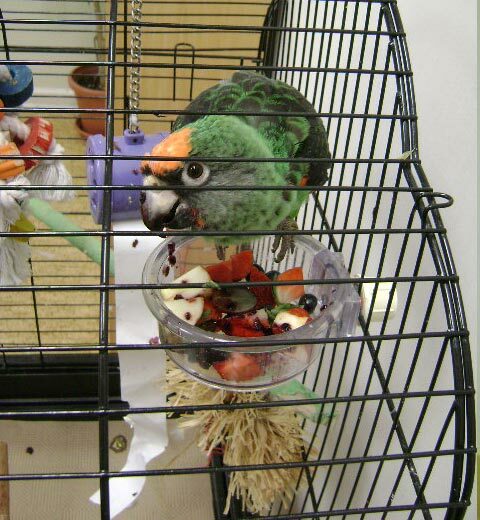 Fortunately Rocky’s organ function appeared to be adequate and additional tests for lead poisoning, psittacine beak and feather disease, psittacosis and polyoma virus were all negative. Rocky was treated with a vitamin A injection, broad spectrum antibiotics, anti-inflammatory agents and a special feeding formula to speed his recovery. In total Rocky required one week of intensive care and over 2-weeks of hospitalization in total before his condition stabilized. During his first week in the hospital Rocky needed to be assist fed and medicated three times a day. Over the second week his treatments were reduced and his body was able to start to repair and regenerate owing to the vitamin A injection and supportive care received during the first week. Despite being a prime example of a bird who would ‘only eat’ seeds, over a period of 2-3 weeks Rocky was converted to a more appropriate diets consisting of 70% commercial pellets, 20% fruits and vegetables, 6% grains and nuts and less than 4% seeds and healthy human treats. Four months later, Rocky is in excellent health and thoroughly enjoys his new, healthier diet and lifestyle.